Last time we talked about indoor air quality, we discussed using PHI generators to kill mold and other microbials polluting the air in our homes. However, if we stop there, we are left with dead particulates that can continue to contribute to allergy symptoms – as can a host of other particulates in our indoor environments. So now, we need to remove as many of those particulates as possible. We do so through filtration, which is the topic of today’s discussion. First, a little about filters: Filters are graded on an efficiency value, or MERV. MERV stands for Minimum Efficiency Reporting Value and is NOT a rating system. The simplest way to describe it is the efficiency of a filter at filtering out particulates of a certain size. Particulate size is measured in microns. The size of a particulate affects how our bodies will respond to it. 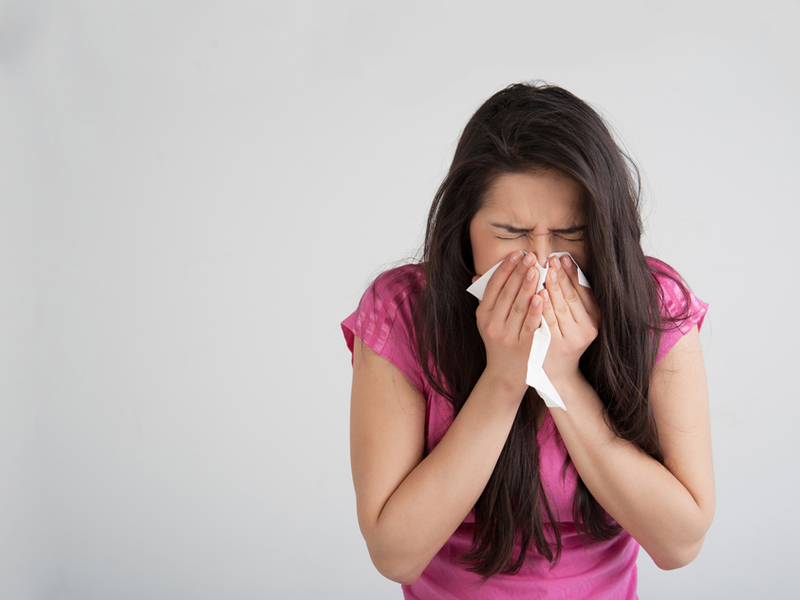 For example, coughing and sneezing are natural defenses against larger particulates (bigger than 10 microns). However, sneezing and coughing are not effective against fine particulates (those that are 2.5 microns and smaller). Their ability to bypass the body’s defenses and lodge deeply in the lungs makes them the greatest risk to public health, according to the Environmental Protection Agency. So, to maximize our indoor air quality and thus our health, we need a filter that is effective against these fine particles, as well. But how do we know what filter to choose? 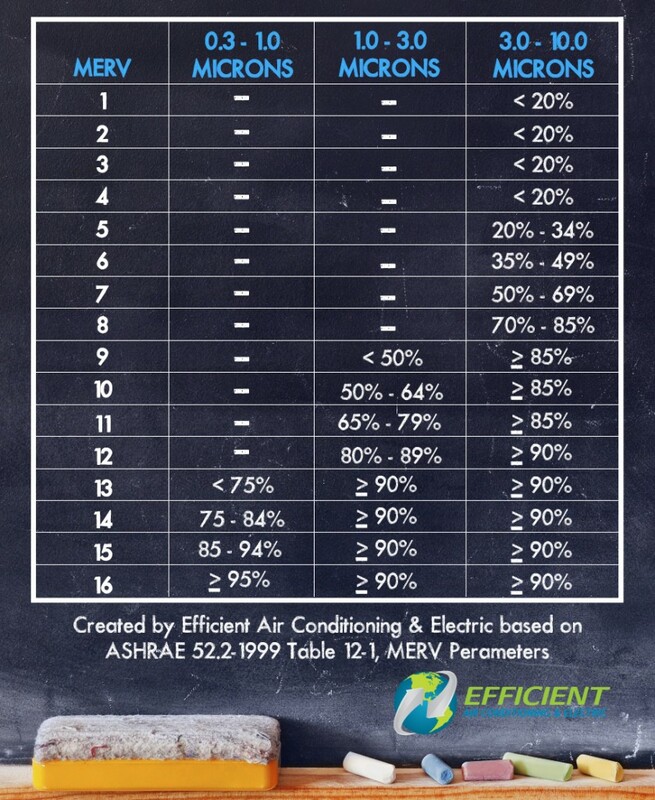 The following table, which we created based on the findings of the American Society of Heating, Refrigeration and Air-Conditioning Engineers (ASHRAE), shows the relationship between MERV and effectiveness in filtering particulates in three different size ranges: 0.3-1.0 microns, 1.0-3.0 microns and 3.0-10.0 microns. As you can see, a MERV 12 filter is up to 80% effective against particulates that are 1.0-3.0 microns, but it has no reported value for particulates in the 0.3-1.0 range. However, a MERV 13 filter is up to 90% effective in the 1.0-3.0 range and up to 75% effective against particulates that are 0.3-1.0. Does this necessarily mean that you should replace all the filters in your home with ones that are MERV 13? No. This is because, in addition to allowing fewer particulates to get through, higher MERV filters also allow less air to get through – and your system may not be designed to handle such airflow restrictions. Just slapping a higher MERV filter in may cost you more in energy usage and make for a less comfortable living space. That’s why it’s important to work with an HVAC professional to find the right filtration solution for your home.